PLEASE, read and follow the instructions below, especially in regard to completing the REQUIRED waiver. Registrations that do not have a waiver will be removed. This signup is intended to allow adults (18 years old or older) who have not sculled much or at all to get some experience with sculling. This will entail a 45 minute outing in a sculling boat, probably a quad with two new scullers along with two experienced scullers. The outing will consist of gentle teaching about sculling, rowing terms and practice. 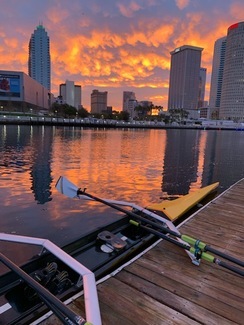 The Tampa Rowing Club offers up to 3 free outings for people considering joining the club. We strongly suggest that you view the online Learn-To-Row Prep Course which will help you learn some rowing concepts and terms. Everyone who rows at the Tampa Rowing Club must complete a waiver. If you have not completed the waiver, please, do so by clicking here. The session is subject to being canceled up until 5 am on the day of the row, usually for weather. We suggest that you provide your mobile telephone number either in your first signup comment or mail it to the organizer. This will allow us to text you should a cancelation occur. The boat is on the University of Tampa campus and you can get directions on this page. You should have socks (covering your calves is helpful) and not wear loose shorts or shirts.